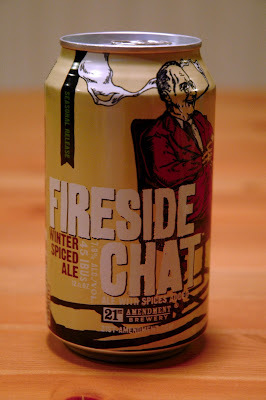 Random thoughts: I first learned about Fireside Chat when I interviewed 21st Amendment's Co-Founder, Nico Freccia. The beer's description intrigued me and I have been looking forward to sampling it, as well as some of the other winter seasonals that are now available. On an unrelated note, I really like the design on the can. Another benefit of cans is that they provide a larger canvas for artwork! The tasting: Color was a deep brownish orange. 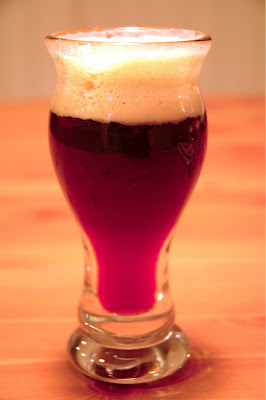 The tan colored head was creamy, had very good retention, and left a nice lacing on the glass. The first thing I noticed in aroma was the complex mix of spices. Although I couldn't identify what they were, they provided a nice introduction to the beer. After the first taste, I was struck by how well balanced this beer was. The malts, hops, a mild sweetness, and the kick of the alcohol all hit my palate at once. After the initial rush of flavor, I noticed the mixed spices. It also had a sweetness similar to what I tasted in Back in Black. While I thought the sweetness seemed a bit out of place in Back in Black, it worked well in Fireside Chat. After it warmed up, the malts were more pronounced. Carbonation level was good and it had a nice mouth feel. Rating: 4 star. Really Good! I want this again. 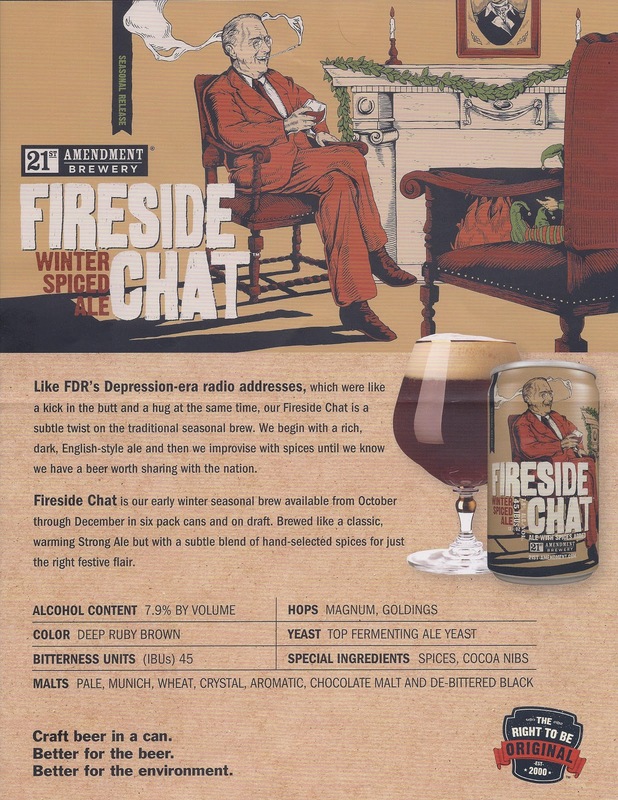 Fireside Chat had everything I want in a holiday beer—a more pronounced malt profile, "warming" from a higher alcohol content, and something unusual thrown in the mix. 21A has just set a high bar for the 2010 class of winter seasonals! When I review beer, I drink it without eating any food. I've never been a big fan of "parings" because I think people should eat whatever they want with whatever they like to drink. I guess this results from my aversion to pretentious wine parings. But Fireside Chat has me thinking about food pairings as I expect it would go very well with holiday meals. Have you had Fireside Chat or any of 21st Amendment's beers? If so, please let me know what you think. I was very surprised by how good it is. I think it is a perfect winter beer. Don't let the fact it is canned make you think twice, it is well worth the price. I'm tasting it right now for the first time and, honestly, all I can taste is metal. So far, I'm not a big fan of craft brew in a can. I'll probably look elsewhere next time I'm in the beer aisle. Yeah a metallic taste would be problematic. I didn't taste it when I tried Fireside Chat. Have you had any canned craft beers that didn't have a metallic taste? It hasn't been a problem for me for the handful of beers I've sampled. Just tried Chat and loved it. Next, I'm going to try the Black IPA. Canned beer really needs to be poured into a glass to avoid the metal taste. But I enjoy it either way. I pour bottled beer into a glass, and I agree that canned beer deserves the same treatment. 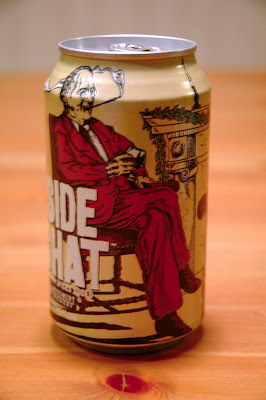 Drinking any beer directly from a can brings back bad memories of industrial lager. I don't go there. 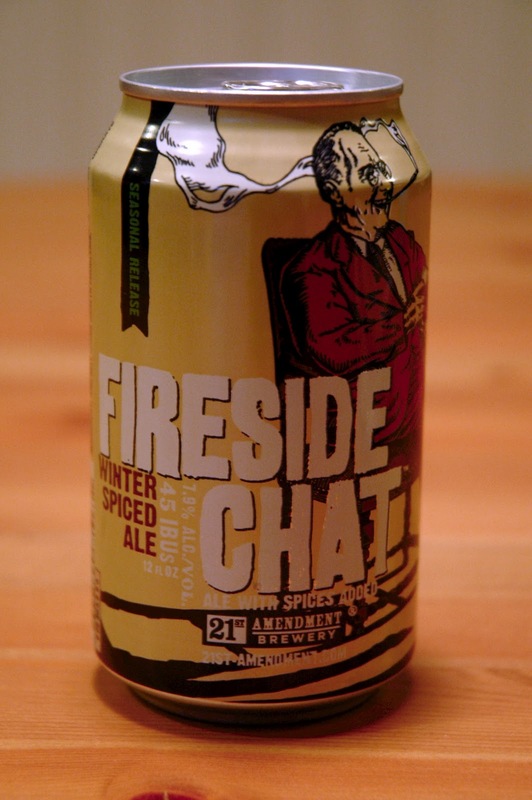 I didn't know that fireside chat has drink. This is great. It looks tasty. I tried this in December and was sadly not a fan. I wonder if the 2012 tasted different, because I couldn't even drink it, which made me sad. 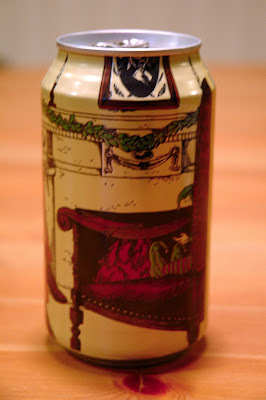 I love 21st Amendment and their cans are really cool! I only tasted this beer once, so I'm not sure if it changed. 21A has brewed some interesting beers lately. Have you seen their oyster stout and saison? Both are available now and I've got them in my fridge. Hope to write about them very soon!